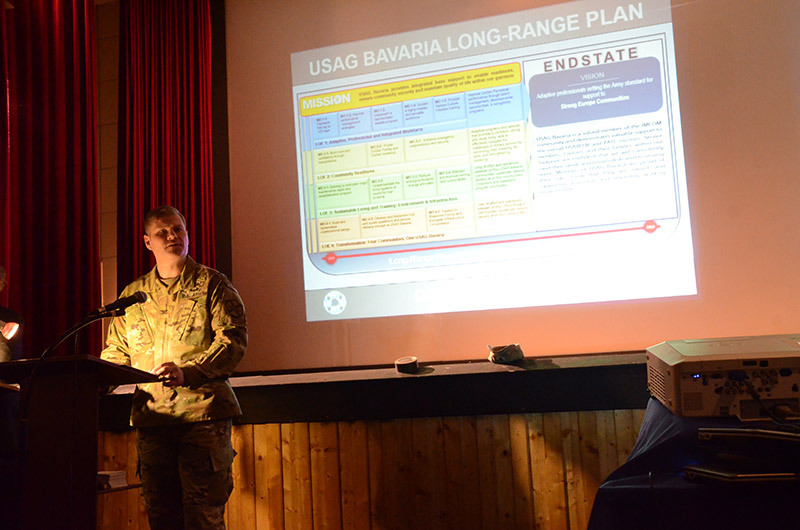 Col. Lance Varney, garrison commander at U.S. Army Garrison Bavaria, recently unveiled his long range plan, which will serve as a framework to improve garrison services, ensure community security and enable U.S. Army readiness. He released the plan after he and his team of directors and staff made a 90-day assessment mindful of higher headquarters guidance, emerging policy directives, internal garrison priorities and directorate operations. USAG Bavaria—the largest oversees Army garrison—is made up of the four communities of Tower Barracks in Grafenwoehr, Rose Barracks in Vilseck, Hohenfels and Garmisch. GRAFENWOEHR, Germany — The garrison commander here recently unveiled his long range plan, which will serve as a framework to improve garrison services, ensure community security and enable U.S. Army readiness. Col. Lance Varney released the plan after he and his team of directors and staff made a 90-day assessment mindful of higher headquarters guidance, emerging policy directives, internal garrison priorities and directorate operations. The ‘One Garrison, Four Communities’ concept refers to the four communities that make up U.S. Army Garrison Bavaria: Tower Barracks in Grafenwoehr, Rose Barracks in Vilseck, Hohenfels and Garmisch. In 2016, Lt. Gen. Kenneth Dahl, the commanding general of Installation Management Command — the agency that oversees all U.S. Army garrisons — explained in his June 2016 Service Culture Initiative that IMCOM would need to “buy back” critical areas associated with maintaining Army readiness. “Therefore, IMCOM can no longer provide the same level of service that our customers have come to expect,” Dahl said. What Varney and his team of directors are trying to do is provide guidance in the face of these pending resource challenges and reductions in personnel and funding. Concurrently, the USAG Bavaria community must prepare for fluctuating services and infrastructure demand as result of a continual presence of rotational forces here. Also shaping the plan was a series of trends that surfaced in a recent employee command climate survey, including reductions of resources, work overload and communication issues. Those trends among garrison employees, Varney acknowledged, lead to low morale, high levels of stress and exhaustion. “But these trends help us to formulate a plan for 2017 to be more predictable, and figure out how we can improve —or in some cases establish — processes required to support our communities,” Varney said. USAG Bavaria is a valued member of the IMCOM community and demonstrates valuable support to the overall USAREUR and 7th ATC missions. Service members, Civilians and their Families within our footprint are confident that we will consistently meet their needs and remain dedicated to serving them. Members of USAG Bavaria are proud of their role, know that they are valued, and experience a positive and rewarding working environment. But to get there is easier said than done. That’s why the long range plan is grounded in four core principles known as lines of effort. Each line of effort, or LOE, recognizes and addresses long- and short-term strategic challenges; focuses on the development of operations of mission partners, stakeholders and customers; and addresses the differing needs of each of the four communities.